For those of you who have never been to Budapest, you need to come for a visit! It is a gorgeous city built right on the banks of the Danube, rich with history and culture. Those who have been here will no doubt agree when I say that it is the gem of Central Europe, and that it rivals any of the more well-known capitals of Western Europe in beauty and charm. Of course, if you do not agree with me, you are completely within your rights, but I feel compelled by the truth to tell you that you are mistaken in your opinion! If it is not already clear from that introduction, I am having a wonderful time working as an intern in the US Embassy in Budapest this summer. I have been on the job for a little over a month now, and although it is too tall a task to attempt to share all that I have done since arriving in June, I think I should be able to give some broad highlights of my stay in this short blog post. The first, and in my opinion, most important highlight of my summer so far has been my inclusion in the embassy community here in Budapest. From my first day in the country, I have been welcomed by everyone with open arms, and everyone’s warmth and kindness has truly made me feel right at home for the summer. I am one of a handful of American interns in the embassy, and in addition to us there are five or six Hungarian interns as well. We are all college students and naturally, we have become good friends as we have worked together this summer. Beyond my friendships with the other interns, however, it has been so great to be welcomed by everyone else in the embassy, from security guards and drivers all the way up to the ambassador herself! The community and camaraderie of the mission here in Budapest is wonderful to be a part of, and without a doubt it has laid the foundation for the amazing experiences I am having here this summer. Next on my list of highlights during my work here would have to be the work itself. Although I cannot say that every day is filled with exciting opportunities, in general my weeks are busy and I have the chance to do work on diverse subjects in many different capacities. My favorite part of the work is to attend conferences, receptions, ceremonies and the like as a representative of the US Embassy. I have attended conferences about immigration from the Middle East and about the Ukraine conflict, ceremonies commemorating Hungarian WWII heroes, toured the Jewish district with representatives of leading religious groups, and accompanied the ambassador at diplomatic events such as the Bastille Day celebration at the French Embassy. Each event is an opportunity to meet leaders from the Hungarian private and public sector, not to mention other foreign diplomats. And on days when I work mostly from the embassy I am busy researching important issues ranging from the current immigration crisis to Russian gas trade and everything in between. Lastly, this summer has been incredible not only because of my experiences through the embassy and its community, but also because of what I have been able to do with my free time. As I mentioned above, Hungary and Budapest in particular, is beautiful. 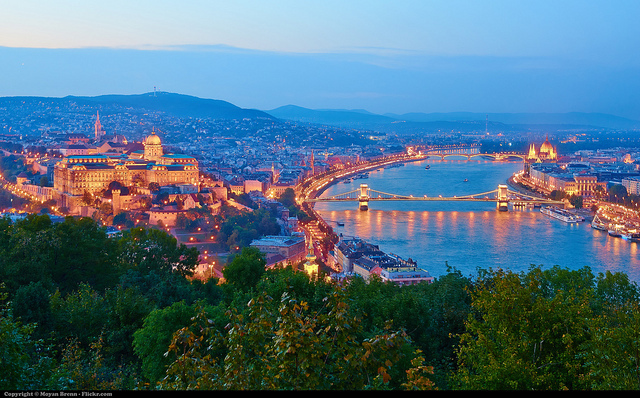 Whether it is an afternoon spent at one of the many famous bathhouses, a nighttime cruise on the Danube, or a tour of an historical building, there is never a reason to be bored in Budapest. I also have had the chance to visit many friends of mine who live in and around Budapest, which has brought back cherished memories. Finally, the convenient location of Hungary has allowed me to extend my travels to Denmark, Malta, and in the upcoming weeks Istanbul too. It is an incredible feeling to know that in just a short plane ride’s time I can be in exotic and interesting destinations for a fraction of the cost of what I would pay were I travelling from the states. In short, my experience so far has been wonderful, and I have every reason to believe the second half will be just as great!